Two brothers get creative in Chevy Chase, Maryland. Like the pearl in an oyster, Sushiko in Chevy Chase has a gleaming prize inside. It's an 8-seat counter that offers kappo tasting menus—including an all-vegan selection—that go a step beyond omakase into sushi sorcery. Kōbō, the Japanese word for atelier, is truly an artist's workshop, where guests can watch co-executive chefs and brothers Piter and Handry Tjan whip up 12 to 15 intricate and fascinating courses. Perhaps the most interesting aspect of this restaurant within a restaurant, is that the chefs are pioneering the concept of vegan kappo, defying guests' visual expectations and serving baffling creations that could be found in a chemistry lab. Kōbō's vegan kappo menu changes each season, but every dish is rooted in Japanese tradition and elevated with innovative techniques. 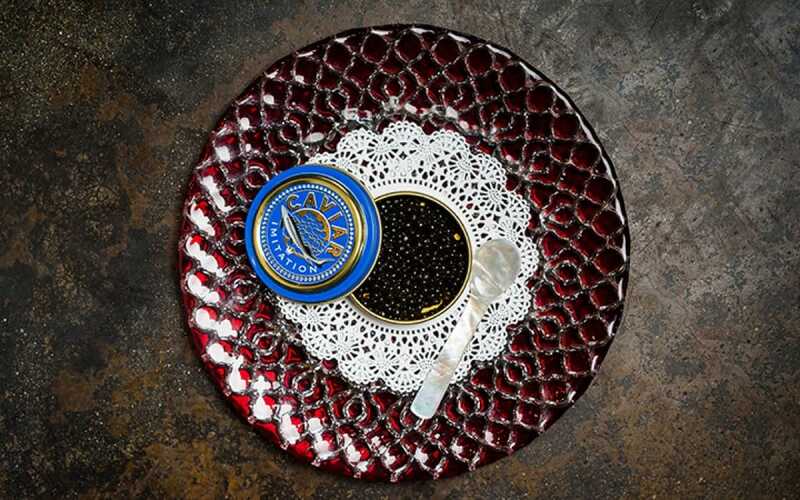 On the debut menu, a tin reading "caviar imitation" housed tiny black beads of seaweed, which had the same briny, savory qualities of the real McCoy. The illusion was achieved by cooking nori with agar-agar and then dropping individual globules into oil to seal them. It's an intricate process, but Piter promises the mock caviar will be making appearances on future menus. 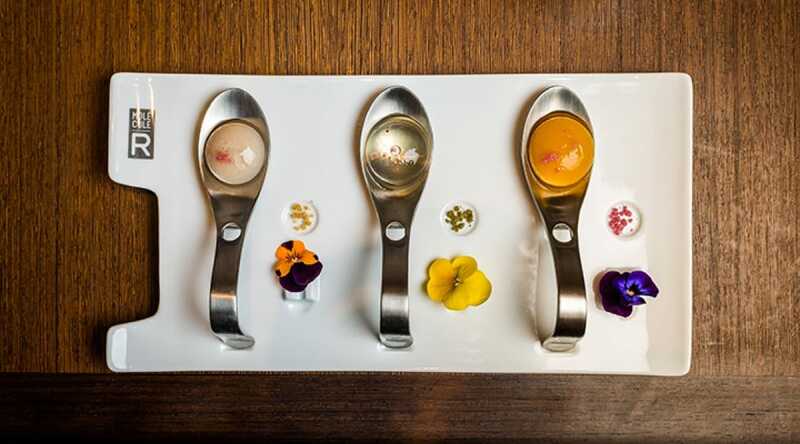 A staple course has been the delicate spheres of liquid inspired by Ferran Adrià's experiments at El Bulli. Made using a mineral solution that creates a skin around the liquid, the wobbling spheres burst in your mouth, releasing the flavor within. The autumn menu's sphere features kabocha squash topped with pickled cucumber, pickled red radish, pistachio, and pink peppercorn. Spheres of liquid inspired by Ferran Adrià's experiments at El Bulli. Nigiri is always on the menu as well, but instead of raw fish, the rice is topped with pickled or blanched vegetables. Some—like mashed kabocha squash and pickled myoga ginger—are meant to look like their seafood counterparts. The mound of amber squash mimics the prized sea urchin, while the painted red myoga could pass as raw tuna or red surf clam. 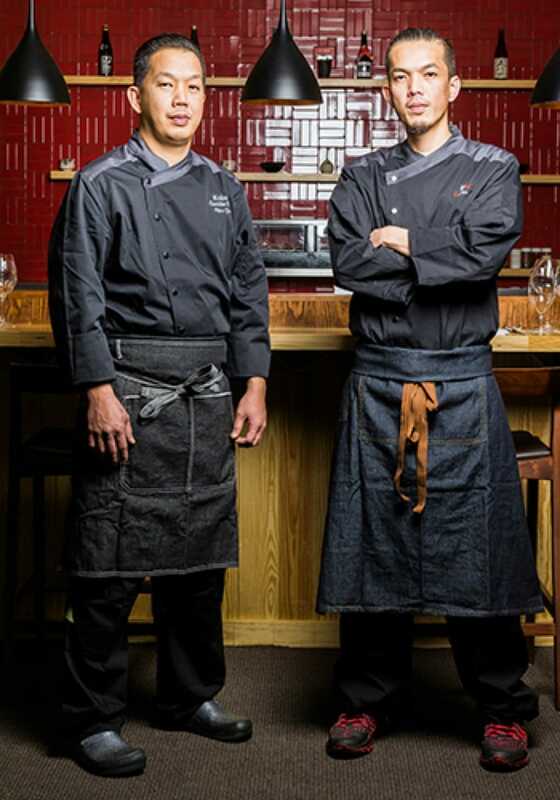 Chefs Piter and Handry Tjan have an undeniable talent for Japanese cooking, but neither of the Indonesian brothers has ever set foot on the island. 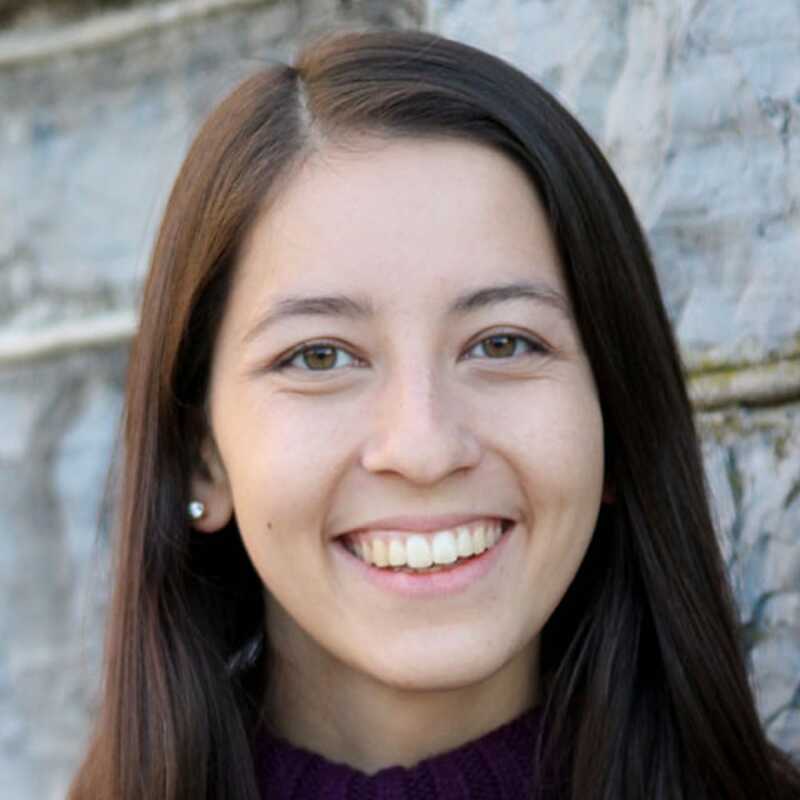 They both came to the U.S. as teenagers and Piter began working in Japanese kitchens doing basic jobs like scaling fish and cooking rice. He soon fell in love with the cuisine and eventually introduced it to his brother, Handry. They both continued to hone their skills by working in various restaurants and traveling around the U.S. to taste and explore. Their Indonesian heritage comes out in some of their vegan kappo dishes as well. Growing up, their mother volunteered at a Buddhist temple, so the brothers became accustomed to eating vegetarian food. Their signature otsukuri course is currently an homage to the Buddhist tradition of using gluten to recreate the texture of meat. They bake namafu (a refined wheat protein) and then top it with sesame seeds, lemon miso, and chile oil. The chefs have also found ways to make vegan versions of other Japanese staples, like dashi. By omitting the bonito flakes and relying only on kelp, they can produce a beautiful broth that's used in everything from tofu dishes to rice porridge. Mushrooms are another star ingredient because of the earthy umami flavor they impart. Between grated truffles and marinated enoki mushrooms, you don't even miss the meat. Another fascinating course on the autumn menu is a twist on the hand roll. 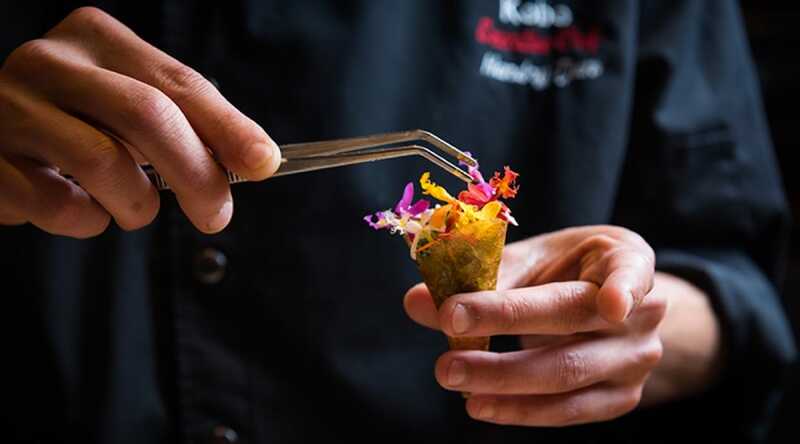 Micro lettuce and orange powder are tucked inside a crisp, translucent yuzu-soy cone that shatters as you bite into it. The cone is made by dehydrating potato starch, yuzu and soy. Piter and Handry are already working on the winter menu, and they also have plans to serve a Cherry Blossom Festival-themed kappo in the spring. A few dishes may stay on, but the two also plan to dream up eye-catching new dishes. "Inspiration is coming from pretty much everywhere," Piter says. The vegan kappo menu ($130 per person, tax and gratuity included) is available on Mondays and Tuesdays at 7:00 p.m. The non-vegan kappo menu ($160 per person, tax and gratuity included) is available Wednesdays and Thursdays at 7:00 p.m. and Fridays and Saturdays at 6:00 p.m. or 8:00 p.m. Beverages are available à la carte. Reservations are required. All images courtesy of Kōbō. Photo credit: Rey Lopez.